eg Jeff Collins - Crime Reporter (Magno 1946), Mark Park (Super Duper 1947), Marsman (Marsman 1948), Johnny Amigo (Jolly Western 1949) etc. Sir Solomon Snoozer, Rusty, Fighting Forkbeard, Willie Willikin's Pobble, The Galloping Glory Boys, Westward Ho! with Prince Charlie's Gold, Young Drake, Mickey's Tick-Tock Men, Crackaway Jack*, Turtle Boy, Robin Hood, Around the World in Eighty Days. Red Rory of the Eagles*, Bird Boy, General Jumbo, Longlegs the Desert Wild Boy*, Young Davy Crockett, The Wooden Horse. Flip McCoy, The Jolly Rogers, Jimmy's Mighty Midgets, Captain Blood, Rob Roy, Wulf of the Arrows, Mystery Nick- the waif from nowhere. Uncle Tom's Cabin, The Old Curiousity Shop. * = more than one series drawn by PB in 1950's period. What an amazing amount of classics he drew..and this is only for those decades.. It does leave you breathless..
Will now search out my old Dandy annuals..Beano of the early 50's.. Thanks Kashgar for doing this..very useful..and interesting..
please use a magnifying glass to read at bottom corner of computer...I did the resolution at 75!! I've cracked it Lew...when I was scanning it I changed the setting to custom and changed to 75...then scanned..so I'm cooking.. Thanks Kashgar the info helped for me to do this post.Crackerway Jack is coming soon. You're more than welcome Peter. Here is a list of Paddy's work for the mainstream comic titles covering the rest of his career (excluding reprints). The Crackaway Twins, Blitz Boy, The Island of Monsters, Iron Hands, The Boy From Lilliput, The Amazing Peet from Planet K, The Talking Ball, Dave the Brave. After finishing his last strip for the comic titles, Dave the Brave in the Dandy in 1980, Paddy spent the rest of his artistic career drawing for the Thomson girls' picture papers, something which he had been doing on a regular basis for the previous twenty years in any case. Judy being the home of most of his efforts in this regard and a title for which he drew at least fifty strips, although sadly, not all catalogued but including in the Judy's first two years of publication, 1960-1962, four series featuring ballet dancer Sandra, Sandra of the Secret Ballet, Sandra and the Runaway Ballet, Sandra and the Frightened Teacher and Sandra and the Hoodoo Ballet. A fabulous artist! I'd especially like to see a large-size collection of his Allan Quatermain trilogy from Topper as, to my mind, nobody has ever displayed such a natural feel for the works of Rider Haggard (and that includes Ron Smith and Dudley Watkins! ). Absolutely agree Phil. Although, as both his King Solomon's Mines and Allan Quatermain were redrawn copies of Watkins' original Topper versions it was only with The White Witch, which featured in Topper's full colour centre-spread, that we get an absolute idea of how Paddy sought to interpret the work of Rider Haggard. It is brilliant though. Thanks for posting that, I've seen the final episode in one of the Beano-Dandy books, and I've been curious to see other episodes ever since. I have shown Dudley D Watkins version before at the blog..
would be nice to see on here if you have an example..
Just been looking at Paddys Iron Hand in The Dandy 1971..just an exciting adventure story..just wonderfully drawn..
it was only with The White Witch, which featured in Topper's full colour centre-spread, that we get an absolute idea of how Paddy sought to interpret the work of Rider Haggard. It is brilliant though. Though I've got most episodes of the later two sequels I really wish I had more examples from 'The White Witch' (adapted from a Rider Haggard book better known simply as 'She'). 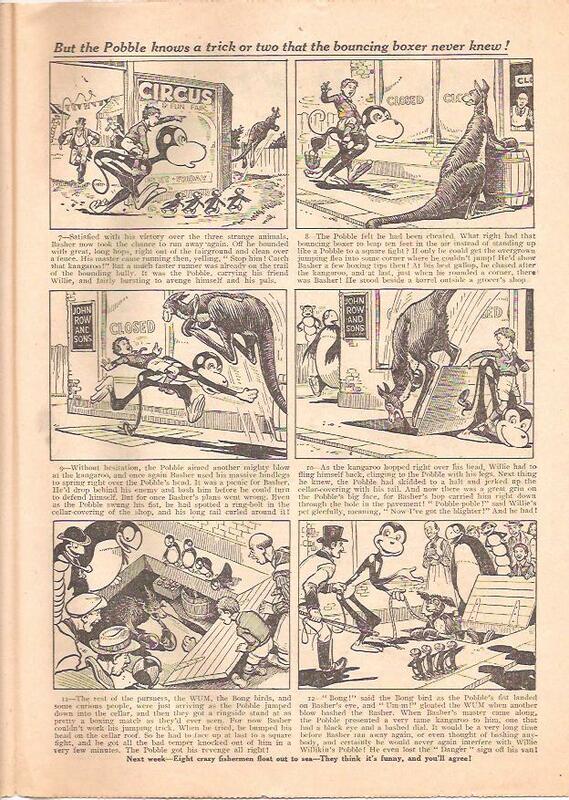 As can be seen in this action-packed installment Brennan was capable of producing work that IMHO bears comparison with some of the very greatest newspaper strips, such as Hal Foster's Prince Valiant. One thing that impresses me is the positive depiction of certain black characters - particularly the noble warrior Umslopogaas who has far more in common with Conan the Barbarian than any of the usual racial caricatures that tended to appear in British comics of the early 1960s. Love seeing the large figure work..and in colour..large scale..
Will use this for a blog post thanks Phil..
Patrick (Paddy) Brennan (b. 1930?, d. early 1980s or c. 2000?) 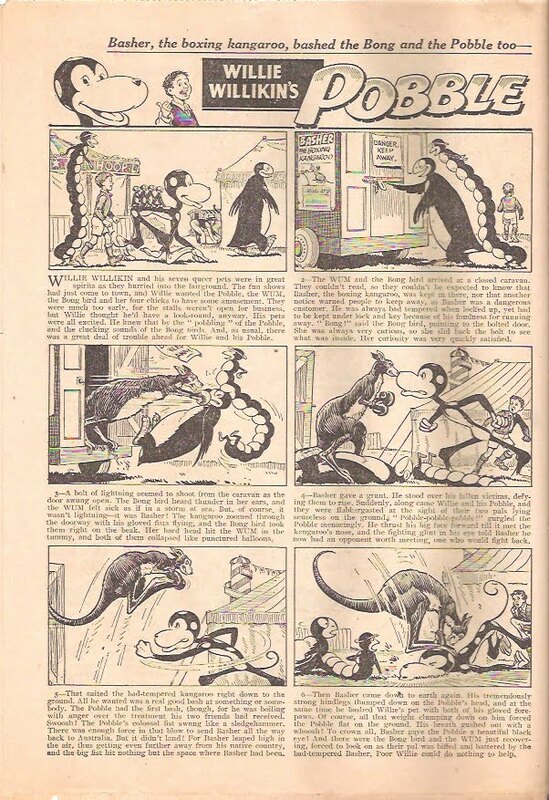 was a comics artist from Dublin who drew primarily for Dundee publisher D. C. Thomson. There might as well not be a death date there if it's in so much doubt.